NOW SOLD OUT in Estero, The Preserve at Corkscrew is an exclusive gated community, with a prime location, just 2 miles east of I-75 on Corkscrew Road. The community’s peaceful ambiance is created by mature, lush landscaping, glistening lakes and exclusive amenities to support your active lifestyle. The community is designed as a quaint residential neighborhood consisting of a variety of single family home styles, with many home sites featuring picturesque lake and preserve views. The developer, Cameratta Companies, has selected Lennar Homes and Pulte Homes to be the Premier Builders in the community. 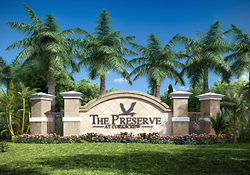 Cameratta Companies continues to provide its tradition of unique development here at The Preserve at Corkscrew. Its portfolio of successful projects spans thirty years, and includes single family and multi-family residential communities, high rise condos, golf course communities, retail and commercial projects. The diversity in Cameratta Companies development achievements hold to a common core philosophy of paying attention to every detail by staying involved and overseeing each endeavor from creation to completion.